THE ROT is a great post-apocalyptic read. The cover is awesome. This is my first time reading Paul Kane, but it won’t be my last. I like his style and prose. There is several things that stand out about this novella. First, THE ROT is packed with vivid scenes. Second, it feels like an original story. Third, it stands out because of the way the story is told. Adam Keller is an excellent character. He volunteers to wear a state of the art environment suit. Adam seems to be the only person not affected by the contagion. The other characters come and go, given the circumstances and all. The story is told by Adam Keller through his series of recorded journal or blog entries. The dialogue feels real. The post-apocalyptic world creates is one of decay and bleakness. The title has multiple meanings, which makes this novella even better. THE ROT has so much humanity. It contains violence and emotional turmoil. It’s a nailbiter. You will be hit with a rush of adrenaline. There are some things you can’t unsee. This novella packs a heavy punch right to the gut. This is one of the best novellas I’ve read this year. 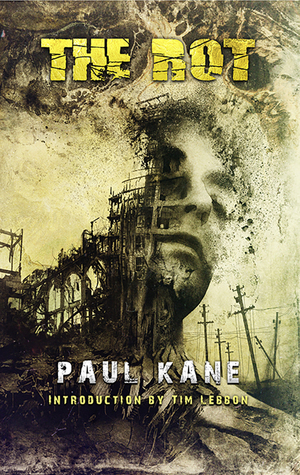 I will be checking out Paul Kane’s other works. I devoured this great story in no time! If you like great stories, then you should read this one.